A perfect green salad strikes just the right balance of textures, flavors and colors. If you're the kind of cook who finds formulas reassuring, this basic salad formula takes all the guesswork out of making a perfect salad. The main ingredient in a green salad is the lettuce. But just as lettuce by itself does not a salad make, using only one kind of lettuce in a salad can be dull, and a dull salad is a missed opportunity. A salad generally comes at the beginning of a meal, and as such it should wake up your taste buds and stimulate your appetite. It should be vibrant and enervating. One way of achieving that is to use different varieties of lettuce to highlight contrasting flavors, textures and colors. 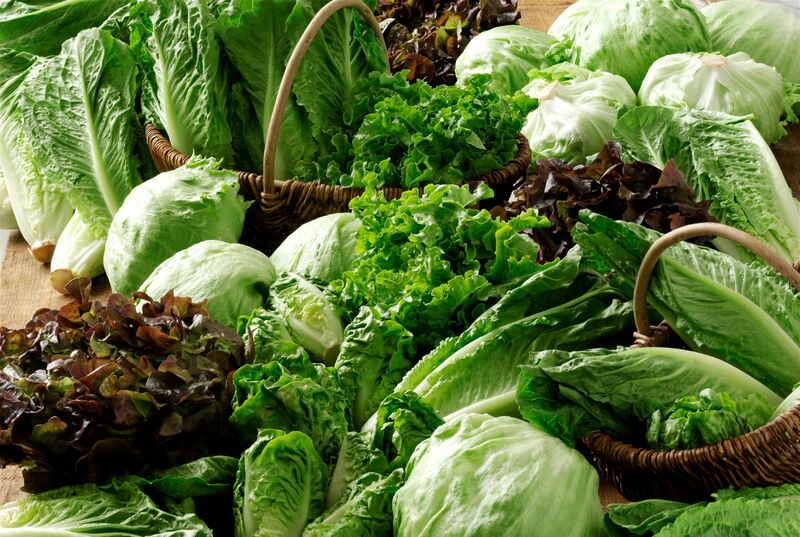 The most common types of lettuce for salads include iceberg, green leaf, red leaf and romaine. A good rule of thumb for a salad is to feature any two of these. Maybe one leafy variety and another that's a bit more crunchy. This also keeps things simple in your fridge. Are you really going to use four different heads of lettuce? Romaine is especially versatile, since it's leafy at one end and crunchy at the other. Bibb (sometimes also called butter or Boston), arugula, frisée and even fresh spinach are excellent choices for second (or third) lettuces. You can certainly add a handful of bagged salad greens for contrast. But beware—even though most prepackaged salad greens are prewashed, it's still a good idea to check for bugs. Another part of the lettuce equation is how to prepare the greens. Obviously you can't just serve whole lettuce leaves. Your lettuce should be cut into bite-sized pieces. (The same goes for the other ingredients in a salad) The point is, you shouldn't have to saw at your salad with a knife. And notice that the key word is "cut." Some people suggest tearing lettuce rather than chopping it. Chopping it, they say, damages the cells in the lettuce leaves, causing it to turn brown. Tearing it, they say, leaves those cells intact. It's a nice theory, but the truth is that tearing lettuce ruptures just as many cells as slicing it. Meanwhile, tearing is much more likely to bruise the leaves, which causes wilting. Besides, the clean edges of chopped lettuce look nicer, and it's much easier to get uniform sized pieces using a knife. A green salad without tomatoes is as joyless a proposition as a hamburger without a bun. But what kind of tomatoes? Your classic hothouse tomatoes are a fine choice, but they're heavy and watery and can weigh a salad down with extra liquid. Cherry tomatoes are much better. But be sure to slice them in half before adding them. Trying to get a fork into a whole cherry tomato is just aggravating. Of course, it'll be equally aggravating for you to try to slice them in half using a dull knife. Which makes this an apt moment to remind you of the importance of taking care of your kitchen knives. Dull knives are not only a pain to use, they're also more dangerous. A serrated knife happens to be the perfect tool for slicing tomatoes. It's a Salad, Not a Smorgasbord! Here's something else to keep in mind when making a salad: Don't fall victim to "salad bar syndrome," where you load it up with too many ingredients. Lettuce, tomatoes, onions, corn, black beans, shredded chicken, blue cheese, hard boiled eggs, pecans, crispy noodles—that's not a salad, it's a smorgasbord. A good salad strikes the perfect balance of textures, flavors and colors. But it's tough to balance something with 17 separate ingredients in it. To keep it manageable, in addition to the lettuce and tomatoes, a green salad should include one or maybe two additional vegetables. Sliced red onion is a great choice since it contributes color, crunch and pungency. A second one could be sliced bell peppers, or shredded cabbage, or shredded carrot, or sliced cucumbers. Also, strive for a blend of colors as well as flavors and textures. So instead of green bell peppers, try orange or yellow ones. Finally, instead of chopping your salad veggies into little pieces, slice them into bite-sized strips or shred them. Diced veggies invariably settle to the bottom of the bowl when you toss the salad, but strips and shreds are more likely to remain distributed throughout. Also, it's important that your lettuce be crisp. Crispness has to do with freshness, of course, but how you store your lettuce will determine how long it stays crisp. The way to do that is to make sure you keep it in the fridge, in a colander or salad spinner basket (you can also use the spinner to dry the greens after you wash them) with some damp paper towels over the top. Salad greens need air circulation. Sealing them up in plastic bags will actually cause them to wilt faster. Wet salad greens are another no-no. If your lettuce is dripping wet, your salad dressing will just slide right off the leaves and pool at the bottom of the bowl. A green salad should be served chilled. Warm greens are wilted greens. And one of the quickest ways to warm your greens is to serve them on a warm plate. Have you ever had a salad that was served on a plate that felt like it just came out of the dishwasher? Instead, try chilling your salad plates. It's easy! Just refrigerate them for about 30 minutes, and they'll be nice and cool when you're ready to serve. Your salad, and your guests, will thank you. 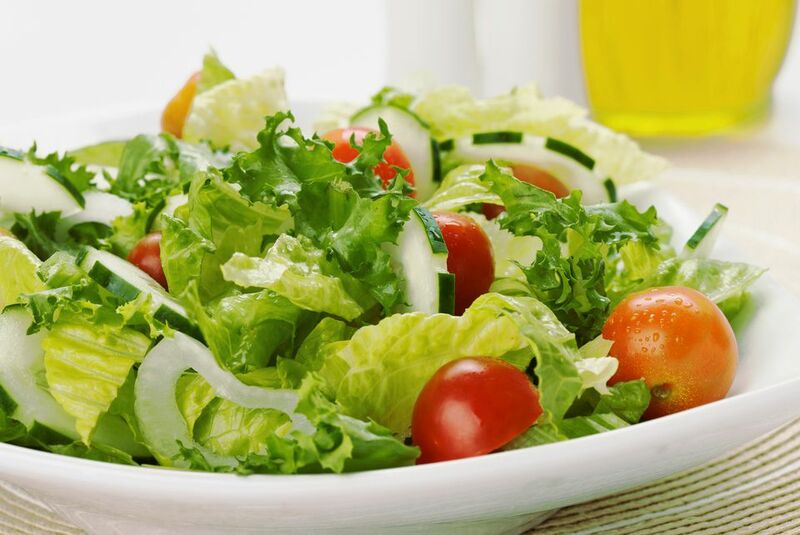 Hold off on dressing the salad until right before you serve it, otherwise it'll get soggy. And don't drown it. You just want to lightly coat each piece of lettuce. Spoon the dressing over the salad and gently toss. Add more dressing if necessary and toss again until everything is lightly coated. For best results, use a vinaigrette dressing, because mayo-based dressings like blue cheese or ranch will weigh down the salad too much (although persuading a blue cheese or ranch fan of this is probably a bridge too far). Finally, if you're a crouton person, add them at the very end, after the salad has been dressed and after each salad is plated. That way they start off on top and won't get soggy.